There is no shortage of high-end mirrorless cameras to choose from these days, and Panasonic is adding one to the bucket with the Lumix GX8. It’s out to capture your attention with 4K video and some advanced technology for keeping your shots stable as hell. Panasonic gained renown in the 4K arena with last year’s GH4. Since then, it has been working ultra high res video into its lower-end micro four thirds cameras. But the GX8 is the most advanced model since the GH4. 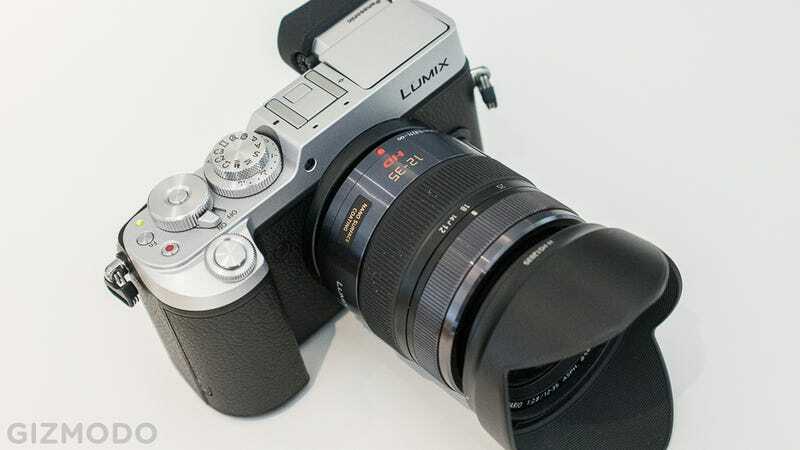 At a hefty $1200, it shoots for glory with a brand-new 20 megapixel sensor inside a classic looking body. In the camera world, 20 megapixels isn’t a notable spec except for the fact that the GX8 has the very first micro four thirds sensor to exceed 16 megapixels. That’s cool I guess, but doesn’t mean much for camera shoppers exposed to throngs of cameras sporting even higher megapixel counts vying for their dollars. A tad more resolution is nice, as long as it doesn’t affect the low light performance (the standard downside of higher resolution). The GX8 actually has a higher max ISO than the GX7, at 25,600. Panasonic says it should do great in low light. We’ll see! There are neat things in the GX8 though, besides just 4K video and a slightly higher res sensor. The thing I was most impressed by when briefed on the camera is the stabilization system. It’s called Dual IS, which means that both the sensor and the lens shift on various axes to stabilize the image. When I tested the stability, it worked extremely well. I was able to shoot sharp images at 1/8 of a second at a 70mm (35mm equivalent) focal length. That’s more than I have been able to do with Olympus or Sony’s lauded sensor shift systems. One caveat is that Dual IS only works with Panasonic lenses, almost all of which are compatible (some will need firmware updates ). Another caveat is that Dual IS will not work while recording 4K. It only works for stills and HD video. That blows, to be honest. Everything else about the GX8 is about what you’d expect from a high-end mirrorless. It’s going to focus extremely fast, and operate smoothly with well-placed controls. Panasonic excels at these things. It actually claims that autofocus tracking is improved 200% over the GX7. The magnesium alloy body is weatherproofed and features a flip-out display and a viewfinder, both of which are OLED. the EVF tilts up and down—something that many people found fairly useless on the GX7. Note: the eyecup seen above on the black version of the GX8 is an accessory sold separately. What might turn some people off is the sheer size of the camera. It’s really big! Much bigger than its predecessor, the GX7. And bigger than many of its mirrorless competitors like the Olympus OM-D EM-5 Mark II or the Sony A6000. It’s about the same size as a Sony A7 Mark II. But that’s a full-frame camera that needs some girth to house the big sensor. The GX8 will be available in mid-August for $1200. It certainly enters a crowded mirrorless field, so Panasonic has its work cut out for it in convincing photogs that this camera is worth their dough.